SOCAP 2010 took place in San Francisco on Oct 4-6. Over 1200 participants. Energetic, lively, sharing, innovative. Impact investments took center stage.Watch these amazing videos of Jacqueline Novogratz (Acumen Fund) Matt Flannery (Kiva) and many more http://video.socialcapitalmarkets.net/live-video-stream/ The first SOCAP Europe will take place in Amsterdam May 31-June 2, 2011. This entry was posted in empowering people, impact investments, innovative partnerships, microfinance investments, MicroFranchising, platform, social entrepreneurship, venture philanthropy on October 18, 2010 by microfinance. SolarAid is an innovative enterprise that aims to combat two of the major threats that humanity faces today; climate change and global poverty. They do so by providing clean renewable energy to the poorest people in the world. According to SolarAid about 2 billion people have no access to electricity-they rely on burning kerosene and wood which are highly toxic and expensive. SolarAid aims to replace these carbon-emitting products with solar power which is more economical and environmental friendly. Their projects include 1) Sunnymoney Micro-franchising (training microentrepreneurs in Kenya to assemble/repair and sell solar products that would reduce their dependency on harmful and expensive kerosene. 2) Solar powered water pumps- this project will test a new solar powered water pump, that will allow families to access clean water for drinking, washing and irrigation 3) electrifying Malawi communities with solar energy. Although SolarAid is a relatively new venture it is worth keeping an eye on as they are in one of the most interesting areas tackling both poverty and renewable energy. 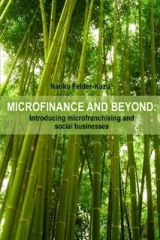 This entry was posted in empowering people, innovative partnerships, MicroFranchising, social entrepreneurship on July 13, 2009 by microfinance. Prof. Yunus, Nobel Laurete and founder of Grameen Bank gave an inspiring lecture titled “A Framework for a better future: the promise of social business” on May 29th at the British Council. He continues to strongly promote the creation of social businesses as these can address and solve the problems of poverty, health care and environment. Prof. Yunus gave examples of social businesses he has been creating in Bangladesh. In addition to the well know Grameen- Danone (joint venture manufacturing affordable yoghurt full of micronutrients for children in Bangladesh) he mentioned Grameen-Veolia (Veolia is a French water company) creating small water treatment plants and BASF-Grameen which will be providing treated mosquito nets at very little cost. He also mentioned the eye hospitals and a healthcare program to create a nursing college as a social business. In the area of environment Grameen Shakti has been providing affordable solar home systems in Bangladesh for the poor. Prof. Yunus call for social business is very timely as the current financial crisis is forcing us to think how can we improve or rebuild the financial system so that it is an inclusive system that would include the majority of the people. You can see the transcript and videos (youtube) of the lecture. This entry was posted in empowering people, innovative partnerships, microfinance, MicroFranchising, social entrepreneurship on June 6, 2009 by microfinance. The 6th Skoll Forum, a gathering of leading social entrepreneurs took place in Oxford on March 25-27th. Prominent figures of the social, corporate, policy, academic area engaged for 3 days in discussions and debates to accelerate, innovate and scale solutions for the world most pressing issues. This year the mood was slightly less euphoric due to the current crisis but one could feel an even stronger and powerful level of energy in the air as social entrepreneurs are becoming even more important players, in Jeff Skoll words, they are likely to come out of this crisis not as survivors but as leaders. He pointed out that social entrepreneurs are masters in leveraging; in producing results with limited resources, they have the abilitiy to do more with less, in choosing which assets can be most efficiently used to meet the objectives, also they maximize resources by collaborating. He could not have expressed it better. Many sessions can be watched in videos and also many blogs are available of the event. This year there were 9 Skoll Awardees. I was especially delighted to see Jordan Kassalow of VisionSpring, formerly Scojo who we have covered in this journal and in my recent book being one of them. This entry was posted in conference/symposium, empowering people, innovative partnerships, MicroFranchising, social entrepreneurship, venture philanthropy on April 1, 2009 by microfinance. Barefoot College (registered as the Social Work and Research Center) was founded by Bunker Roy in 1971 in Tilonia, a small village 350km southwest of Dehli, India. The college follows the lifestyle of Ghandi and it is built by the poor, for the poor and managed by the poor. The college empowers the rural poor by assisting them to develop their capacities and skills so they can serve their own communities better which enhance their self confidence and self reliance. The college trains rural people who are illiterate or semiliterate to become barefoot educators, doctors, teachers, water engineers, solar engineers, architects, designers, hand pump mechanics and accountants to serve their communities while generating income. The college runs pre-schools and night schools that are taught by barefoot teachers. They have also been replicating its approach not only throughout India where 20 colleges have been established in 13 states but also around the world! Pictures of the visit. This entry was posted in innovative partnerships, MicroFranchising, social entrepreneurship, venture philanthropy on February 13, 2009 by microfinance. Hapinoy envisions to become the largest chain store (franchise) of small convenience stores (known as sari sari stores or variety stores in the Philippines). Their aim is to empower microentrepreneurs and help them grow their business. There are roughly 700,000 sari-sari stores in the Philippines and the idea is to convert some of these stores into Hapinoy branded stores. The microentrepreneurs who join this franchise will have access to microfinance (business loans) as well as training for standarized operating systems. Another benefit would be the opportunity to increase sales through new businesses and services brought in by Hapinoy through partnerships. Hapinoy works closely with MFIs (CARD-MRI, TSKI, Kasagana-ka, LMPC) and also partners with manufacturers and service providers (Nestle, Unilever, Colgate-Palmolive, Smart Communications etc). Hapinoy is the first venture by MicroVentures Inc, a social business enterprise founded by Philippine leaders from the social development sector and the business sector. MicroVentures seeks for positive change in the Philippines through empowering microentrepreneurs and pushing the social business enterprise agenda believing that making profit and creating positive change can go hand in hand. Hapinoy is a promising venture that one should keep an eye on. I learned about Hapinoy as I met Markus Dietrich who will be working for Hapinoy as a consultant based in Manila for one year starting this October. This entry was posted in empowering people, innovative partnerships, microfinance, MicroFranchising, social entrepreneurship on September 15, 2008 by microfinance.